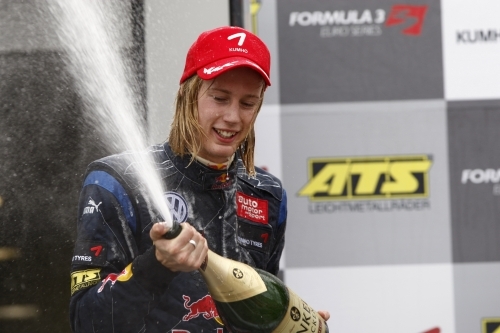 Brendon Hartley took a first ever victory for himself and Carlin Motorsport in the Formula 3 Euro Series at Brands Hatch yesterday. The 19-year-old led from the start and held his concentration after two safety car periods to maintain his lead, despite strong attempts from both BRDC Full Member Sam Bird and Superstar and Full Member Alexander Sims having other ideas. But come the chequered flag Brendon had managed to keep his lead with Alexander finishing second and Sam third. Saturday’s first race was run over a split distance after the red flag was deployed. The race was then restarted later in the afternoon and run for the remaining 18 minutes with Alexander Sims losing third place at the start of the second part to Mucke Motorsport team-mate Christian Vietoris. Alexander held on to take fourth at the chequered flag while Brendon Hartley was eighth. A first race spin for Robert Wickens hampered his chance to close the championship points gap on Andy Soucek in the FIA Formula 2 Championship at Oschersleben over the weekend. Robert managed to get going again and finished the race in eighth place while Superstar Jason Moore was 14th. In Sunday’s second race, Rising Star Robert just missed out on the podium as he finished fourth. Jason meanwhile finished in 20th place. Dino Zamparelli took another podium at Rockingham Motor Speedway yesterday as he finished second in race one on Sunday morning.